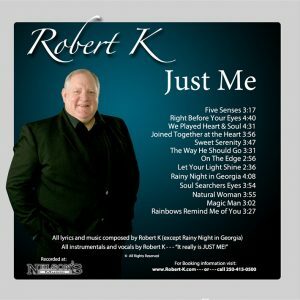 Here are the original liner notes written in 2008 when I produced “JUST ME” – my first solo CD. Doing this album has been on my “Bucket List” for some time. Over the years I have played in several bands and even done some recording as part of a group. I’ve had the the thought that one day I should record a solo album with just music I like and/or have written. So this album is really created for me a sort of a journal and a way to express some of my thoughts and feelings, but with the hope that others might find a song or two that touches them. Having been around musicians who could “really play” for a good part of my life, I am quite self-conscious about my humble musical abilities but I am reminded of the old proverb that says “If the only birds that sang where the ones that sang best the forest would be a very quiet place.” What these recordings lack in sophistication I hope they make up for in honesty. I have to give a lot of thanks to my sweet wife, Marg, for enduring some of the questionable sounds that came for the basement while I recorded this, to my Dad for the gift of music in my life (he’s one of those people who could “really play”) and all of my kids who, each in their own way, have inspired me and made me proud. I live in a very beautiful area by a lagoon with a view of the city across the water. As I contemplated the beauty of my surroundings I was struck by the wonder of how well everything fit together and how, if we learn to be still, there are things we can begin to perceive with our feelings that cannot be observed by our five senses alone. This song is for one of my sons who had been through some tough times. There’s lots that often goes unsaid because there just doesn’t seem to be an appropriate time of place so I wrote my feelings down this way. This song has been floating around in my heart and mind for years waiting to come out and on a weekend in 2008 it was born. It talks about how I feel about my two daughters from my first marriage. If you listen to it I think the meaning is pretty clear. When my wife, Marg heard this for the first time she thought it was so beautiful she cried. My girls said they like it too. That’s all I could ask for. This one started out as an exercise to see if I could combine two different guitar licks I had learned to make a nice “groove.” With a little modification they went together really well. Once I had the little groove created the lyrics just sort of wrote themselves. I first recorded this on a little Fostex 4 track about 30 years ago. This one is a true story about a man who received the promise in a blessing that he had a special work to accomplish that would require him to improve his education. It took over 30 years to find what it was that he was meant to do. Interestingly his chosen profession involved technology that took almost 30 years to become available. As he looked back he could see how amazingly well he was prepared for his life’s work even though, at the time, he felt he didn’t get any answers to his many prayers about what he should do. Though he didn’t recognize it when it was happening he had been guided to develop a very unusual skill set he needed and that his prayers really had been answered after all. I wrote this over 20 years ago when I was going through a very rough patch in my life. It’s really a cry for help as I could feel myself slipping and felt helpless to stop. I think it’s important because I don’t think I’m the only one that has ever felt this way and I want others to know they’re not alone and that they can survive and thrive. This is a cheerful little ditty. My oldest daughter, Celestine, was just starting out in her own consulting business as a speaker, trainer & coach. She’s a very high powered public speaker, an expert coach and trainer but she’s a done this for her employer so starting out on her own came with a bit of trepidation. I wrote this song to help encourage her. She’s doing a lot of teleseminars and I asked her how she was finding speaking without being able to see her audience. She told me her solution was to t lime up all her stuffed animals and talk to them… So I recruited the “Chipmunks” (courtesy of GarageBand’s voice transformer) to do the vocals for the chorus of this song. This is the only song n thei album that I didn’t write myself. I recorded it because it’s one of my favourite songs to sing and since my arrangement is quite different than the version recorded by Brook Benton I thought it was worth including. ON June 1st 2008 I updated this by replacing the guitar riffs with a tenor sax part. I had not played the sax in more than 25 years and to complicate things even more the song is in an awkward key for the tenor sax so it took a fair bit of practicing before I got it right. My poor wife, Marg endured the process in silence but could not restrain herself from expressing her relief when I finally stopped. When I played her the finished mix she was astonished that what she had been listening to turned out to fit so well with the song. (I’d been wearing headphones during the recording so all she heard was the sax) Her reaction mad my heart smile. This is a song I wrote after having an experience like the the Samaritan woman that Christ met by the well when she said, “He told me all the things that ever I did.” It’s a bit of an unnerving experience to talk to someone you hardly know who sees all your weaknesses and knows your secrets without you thinking you have revealed anything about yourself to them. Upon reflection I realized that sooner or later, like it or not, we will all have that experience. Many years ago I taught an early morning scripture study class to high school aged teens. One day we had a lesson about “putting off the natural man.” At the end of the lesson one of my precocious female students stood up on her chair and with a very sassy flick of her hair and an equally sassy tone of voice, put her hands on her hips and exclaimed “I am a natural woman”… I came home that morning and wrote this song. If you think about it you will discover that you have a great many people that you interact with on a regular basis that are cheerful and bring a little bit of sunshine to your life. This song is for all the people (too many to list) that make life a little happier just because they are there. It could be the person who serves your coffee in the morning, the cheerful clerk at the grocery store, the friendly bus driver or a hundred other people we interact with. I suspect they have no idea how much they influence the world around them. This song was written after I had completed printing the liner notes for my first run of the “Just Me” CD. It came as an inspiration one night while contemplating a way to say “thank you” to a computer programmer that I have worked with over the years… he has consistently been able to solve problems others would tell me were not possible. I have no idea how he does what he does. It all seems like “Magic” to me. Over the years he has become a good friend even though I still have very little understanding of what he really does. At the time I wrote this he was also playing drums in a power rock trio so I knew it needed to have some edge to it… hence the best impression of a rock singer I could muster at the time.